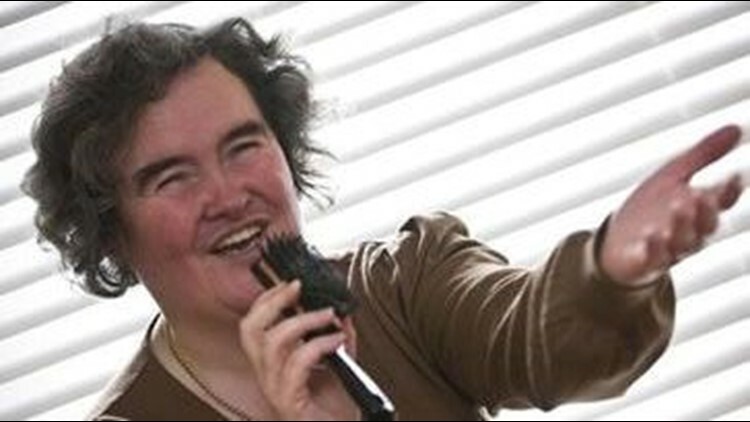 British singer Susan Boyle has a second chance Sunday to wow the world with her soaring voice - and she says she won't ditch the frumpy look that made her an Internet sensation. The shy church volunteer charmed tens of millions of viewers last month, when judges skeptical about her dowdy image were won over by her bold voice and surprisingly confident performance. Boyle's appearance on the "American Idol"-style show "Britain's Got Talent" has been viewed almost 60 million times on YouTube, and the awkward Scot has been praised by celebrities including Oprah Winfrey and Demi Moore. More than a month after her performance of "I Dreamed a Dream" from the musical "Les Miserables," the 47-year-old is ready to appear on a live televised semifinal of the competition Sunday. "If I get through, bloody fantastic! But I am not thinking that far ahead, just concentrating on my performance," Boyle said Saturday. Producers and Boyle have refused to say what song she will perform. Bookmaker William Hill makes Boyle a runaway favorite to win the show's final on May 30. Contestants are competing to perform at the Britain's annual Royal Variety Show - attended by members of the Royal family - and win a 100,000 pounds ($159,000) prize. Boyle, who lives alone with her cat Pebbles in one of Scotland's poorest regions, said she won't be transforming her appearance. "I just want people to see me for who I am, and do my best at singing the song, that's what I am focusing on," she said. The singer, who says she's never been kissed, was ridiculed over her looks when she performed in the show's opening round in April - but startled viewers with her voice. In an update on her Twitter Web site, Moore wrote that Boyle's voice had "made me teary!" Sara Lee, a spokeswoman for "Britain's Got Talent," said Boyle's performance on Sunday will be available almost instantly on the Internet.